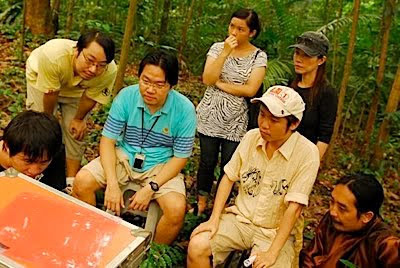 Brief Description of Project: Yan Zhen Shan (Sunny Pang), Chen, Tang (Colin Ho) and other men enter an abandoned mansion to seek Tu Lai, the undead. They vow to kill this most powerful vampire to end the menace that prowl in the shadowy streets of colonial Singapore. Instead of finding the monster, they destroy and burn the boxes of soil that gives the undead its energy. As the men return to Tang's asylum for the mentally sick, they find the lunatic Wang Bu Lao (Vincent Tee) dead and Chen's wife seduced by Tu Lai. Project Tagline: Singapore's short period thriller that is adapted from Bram Stoker's Dracula. SINdie celebrates its 2nd year!